Built upon MSSC’s well-established Certified Production Technician (CPT), the CPT+ Skill Boss program is designed to prepare certificants with the next generation skills to work in a computer-driven, data-intensive advanced manufacturing workplace. 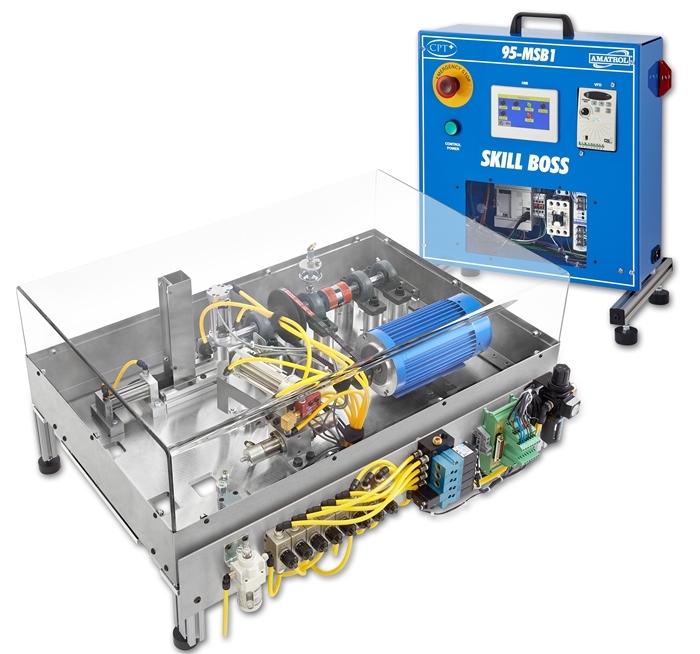 As shown in the Skill Boss Brochure, the “Skill Boss” device is portable, compact, and “classroom friendly.” Together with its associated programmable logic controller (PLC), Skill Boss fits comfortably on a standard 3’x 6′ table. It is strongly built with industrial grade components to withstand heavy use. Additionally, it is designed to cover many of the core technical competencies related to advanced manufacturing discrete parts and process manufacturing. Colorful and multifaceted, Skill Boss will be more fun than a robot for many students and will encourage them to enter a career pathway in advanced manufacturing. Cost-effective, Skill Boss will enable many more schools, including most high schools, who cannot afford a costly lab or tech center, to offer hands-on CPT training and testing. Watch the video below to see the Skill Boss functions! Meets ISO Standard 17024 accreditation requirement that MSSC offer exactly same assessment using the same equipment nationwide. The current MSSC CPT Program remains in full force as a highly successful program for training and certifying individuals with the core technical competencies needed to enter front-line production jobs in all manufacturing sectors. There is no requirement that education and training institutions offering CPT will need to purchase a Skill Boss trainer. Nor will there be any change in the credentialing documentation that MSSC provides for successful completion of CPT Modules. CPT+ is a “stackable” credential. Individuals seeking a CPT+ credential must pass the current multiple-choice assessments for all four CPT Modules: Safety, Quality Practices & Measurement, Manufacturing Processes & Production, and Maintenance Awareness. MSSC CPT+ Skill Boss trained Instructors will issue a “MSSC Transcript” to students who satisfactorily complete hands-on training for each of the four CPT Modules. MSSC will also offer a final, hands-on CPT+ Assessment after students pass all four CPT modules. The CPT+ certification will be on diploma-style parchment, suitable for framing, and include two CPT+ arm patches. Only MSSC Training Solution Providers are authorized to sell the Skill Boss training device and will be responsible for demonstrating Skill Boss to CPT Instructors, for invoicing and collections, and for customer service questions related to Skill Boss. Assessment related questions and orders will be done through the MSSC Headquarter office. MSSC strongly encourages its interested community members currently and/or previously offering CPT, to order the new CPT+ Skill Boss Assessment device. Please contact your local MSSC Training Solution Provider for more information on placing your order. For more information about CPT+ Instructor Training follow this link.